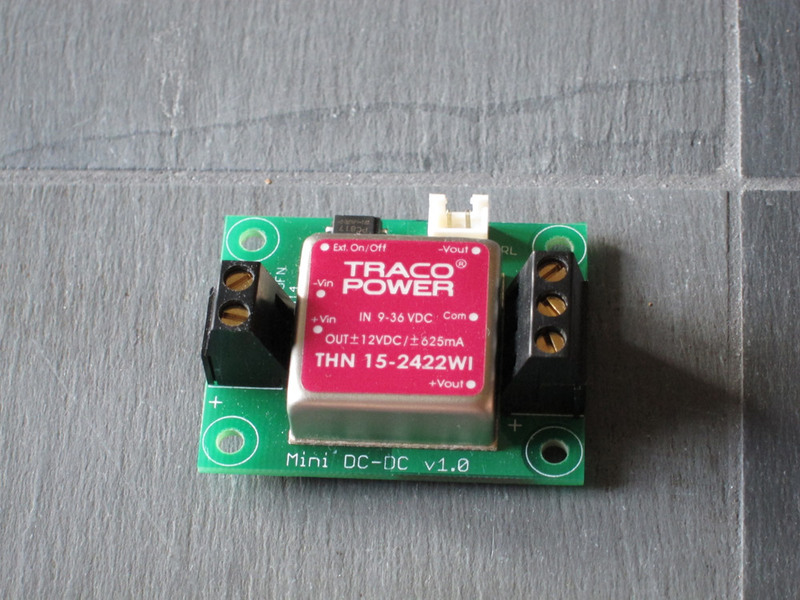 I’ve written a few posts about DC-DC converters and I’ve found them very useful for many circuits where a “complex” (= multi-rail with fixed voltages) power supply needs to be replaced with something “simpler” and more flexible (= single-rail with large variations allowed). However, I have previously largely ignored small SIP-type converters because I didn’t believe they were powerful enough to be of much use. As I (recently) realised you can actually get 3W from several manufacturers and even 5-6W from certain others. That makes it’s possible to get 100mA or more at +/-12-15V which is more than plenty for most small opamp circuits such as buffers, preamps and RIAAs, and of course single-rail 5-12V currents more than suitable for small auxiliary circuits in power amps etc. Now, there are a few drawbacks to these converters: Even the small converters normally still have quite large ripple voltages and I expect there is quite a bit of HF-noise as well, but I’ve tried to use a passive filter to compensate for that. The basic idea is that because the switching frequency of the converter is very high (typically 50-100 kHz) which is nearly 1000 times higher than a linear supply, a simple passive filter is also 1000 times better at removing ripple and noise and so even small capacitor/resistor values for the filter gets you very far. A second drawback is that the converters have limited tolerance for capacitive loading, so it’s normally a good idea to think the power source into the design/build of the consumer circuit. That’s normally also doable though. The basic SIP-8 form factor is used by several manufacturers so there are quite a few different converters to choose from, both cheap and not-so-cheap. One thing that differs between manufacturers seems to be the allowed capacitance load that the converters will tolerate. Here, the more expensive Recoms and Tracos list considerably better specs than the cheaper converters, so that’s worth looking into before you choose. Given how the converter works, this restriction mainly applies to higher voltages of 12-15V or higher – at 5V the load margin is likely to be fine even for the cheaper converters. A while ago I presented my “MiniPre”-project of a simple op-amp based preamplifier. Now I’ve had occasion to put it into use as a small standalone preamp/active monitor controller. The design is very simple, so not much to be added there (whatever you need is probably already in the original post), but it’s basically a standard dual op-amp in non-inverting configuration. The advantage of this simple design is the the selection of opamp tends to have a noticeable influence on the sound signature, so this is one place where there is room to experiment whether different options have better synergy than others. PCBs for DC-DC converters as described here. There are three sizes, for 1”x1”, 1”x2” and 2”x2” converters respectively. These footprints are industry-standard so you can use converters from a variety of manufacturers such as Traco, Recom, Murata and many others. All the boards are in version 1.1, meaning they have been prototyped and minor tweaks made to silkscreen etc. The ceramic caps between the primary and secondary sides should typically be rated for 2-3kV which can be a bit difficult to find. Mouser/Digi-key obviously have them but your local parts suppliers might not. Otherwise, apart from the converter itself, not really. The external components are for EMI filtering and (usually) not required in order for the converter to work. All the caps on the primary side have 1812 SMT footprints. The two component positions on the secondary side can be used for decoupling (required for stability with some converters) or for voltage trim if your converter supports that. These have 1206 SMT footprints. Not all converters have enable-pins and some has the functionality, but wired as “always-off” instead of “always-on”. In this case you need to wire the enable-pin to the negative input voltage in order for the converter to turn on (you can of course also use the optocoupler here, but with the logic inverted). If you use a 4:1 input range converter and you expect to actually use that input range, you need to be a bit careful with the value and power rating of the LED resistor, at least on the two small boards. Both the LED and the resistor are 1206 SMT here. On the 2”x2” board you can fit a 1/2W or 1W leaded resistor and then there should be no problems. Many converters are sensitive to the capacitive loading on the output, so remember to check the datasheet for maximum allowed capacitance. If you exceed this limit it is possble that the converter will refuse to start up. Always remember to refer to the manufacturer’s datasheet and application notes for specifics on pin connections, external component values etc. EDIT 20-08-2014: Added comment on capacitive loading.